St. Louis' favorite 3am bar! HOME TO 101 BEERS ON TAP! 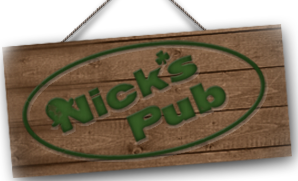 Located in the Dogtown neighborhood in St. Louis, Nick's Irish Pub is home to 101 Beers on Tap. The Authentic Irish Pub serves up food and drink specials daily along with live music throughout the week. Join us to watch your favorite sports teams or enjoy our wide array of entertainment including Skee-Ball, Shuffle Board, Pool, Darts, Golden Tee, Buck Hunter & more! JOIN US FOR INDUSTRY NIGHT EVERY SUNDAY! Every Sunday it's a party at Nick's for our fellow industry goers. We have shot and drink specials, 20% off regular priced food, and live music from 11pm-2am! Just bring a pay stub or wear your work gear. Did you know the upstairs at Nick's is loaded with games and entertainment? Every Monday all games are free; Shuffle Board, Pool, Darts, Golden Tee, Buck Hunter, Skee-Ball, and more. CHECK OUT OUR LUNCH COMBOS! While we are known for our attractive drink prices and late night specials, Nick's is serving up lunch every Monday - Friday. Ask us about our frequent lunch diner cards.